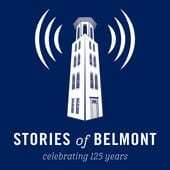 For 125 years, the Belmont University family has woven a story of a “Belief in Something Greater.” In August, non-profit organization StoryCorps – the largest oral history project of its kind and whose stories are heard weekly on NPR – visited Belmont and recorded 17 stories from 34 people from the Belmont community. These oral histories tell some of the greatest moments in Belmont’s 125 years, and the recordings will be archived in the American Folklife Center at the Library of Congress. We will share these stories with you throughout the year on this site. What’s your Belmont Story? Share it here! Subscribe to the Stories of Belmont Podcast on iTunes or Stitcher. Laddie Neil and Mary Niederhauser share fond memories (and a few shenanigans) about their time as students at the all-female Ward-Belmont in the 1940s. Current students Mikaela Clark and Zach Middleton share their stories of how they came to be students at Belmont University, their love for their University and all the things they have learned throughout their journey. Vice President and Chief of Staff, Dr. Susan West, and Telecommunications Services Manager, Gary Hunter, talk about the past, present and future of diversity at Belmont and it’s goal of becoming more diverse and broadly reflective of our local and global communities. Joy Jordan-Lake and Judy Williams discuss Susan Heron, Ida Hood and the founding of Belmont University. Dr. Bob Fisher and Pamela Johnson discuss the story behind Belmont’s hosting of the 2008 Town Hall Presidential Debate. Dr. Fannie Hewlett tells of her experience being the first African-American graduate of Belmont University during her Diversity Week convocation. Dr. Bob Fisher talks with Betty Smith about her father, Dr. Herbert Gabhart, the former president and chancellor of Belmont University. Betty Wiseman and Jack Benz talk about the early days of Belmont Women’s Basketball. Dr. Richard Shadinger and Drew Maddux talk about the restoration of Belmont’s Bell Tower Carillon. Kevin Ingram and Ron Bargatze discuss the history of Belmont University’s men’s basketball program. Dr. Marcia McDonald and Dr. Mike Pinter talk about their teaching philosophies and experiences during their careers at Belmont University. Brennan Mobley and Dr. John Gonas talk about Belmont’s Enactus Team (formerly SIFE) and their world championship win in 2012. Mike Curb and Don Cusic discuss the history of the Mike Curb College of Entertainment and Music Business. Steve Horrell and Randy Smith discuss the day Blanton Hall burned down and the impact it had on Belmont University. Produced by StoryCorps and Belmont University with interviews recorded by StoryCorps, a national nonprofit whose mission is to provide Americans of all backgrounds and beliefs with the opportunity to record, share, and preserve the stories of our lives. www.storycorps.org.